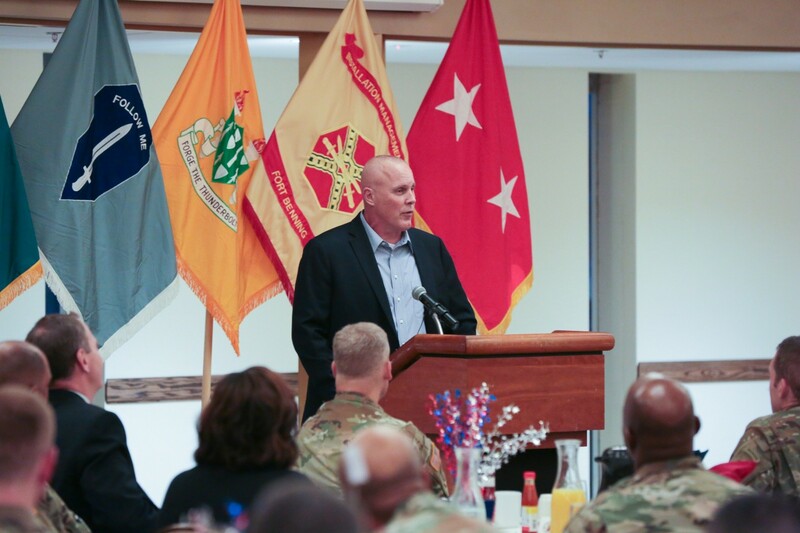 FORT BENNING, Ga. -- A retired Army officer who lost both legs to a roadside bomb in Iraq told a prayer breakfast audience here Feb. 8 that his faith in God was crucial to getting through a long, grueling recovery from his wounds. 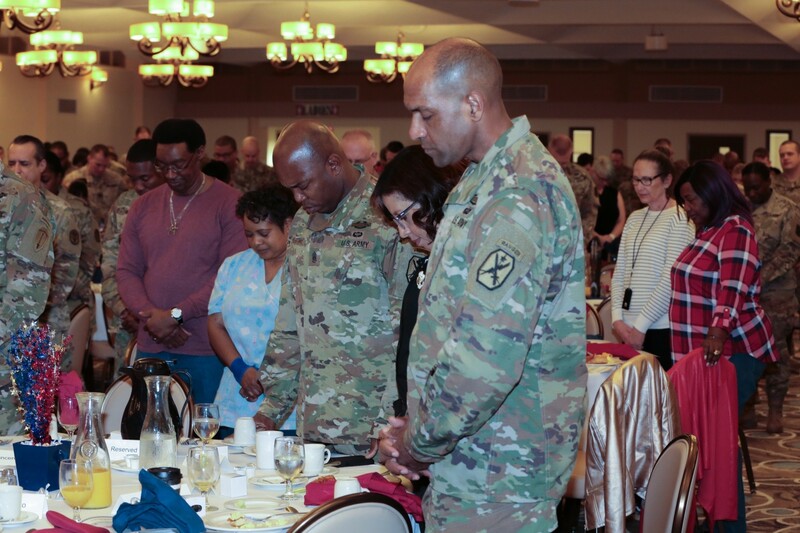 Retired Army Col. Timothy M. Karcher was the guest speaker at Fort Benning's prayer breakfast in observance of the annual National Day of Prayer. The breakfast was held in the Supper Club room of the Benning Club from 6:30 to 8 a.m. Seated in a large room set with white tablecloths and red cloth napkins, the audience of more than 400 dined on scrambled eggs, bacon, grits, biscuits and gravy, fruit, orange juice and coffee. 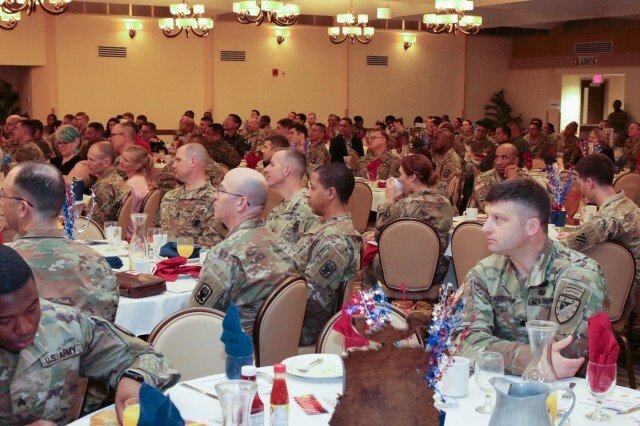 The audience consisted largely of commissioned officers and senior noncommissioned officers with combat experience, as well as some junior enlisted Soldiers and a few civilians. 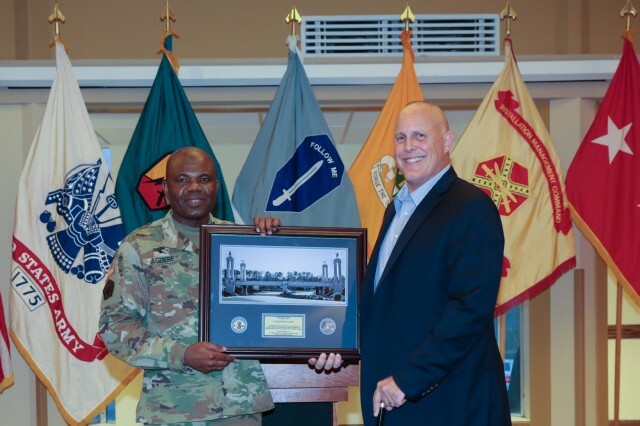 In 2009, during his third deployment in Iraq, Karcher was serving with the 1st Cavalry Division as commanding officer of 2nd Battalion, 5th Cavalry Regiment, 1st Armored Brigade Combat Team, operating in the Sadr City district of Baghdad. While traveling in a mine-resistant, ambush-protected vehicle (MRAP), a roadside bomb exploded under his vehicle, and he immediately sensed that both legs were broken in the blast. "Many of you, probably most of you in this room, have been blown up before," Karcher said, addressing himself to the combat veterans, "You know, you see it, your hear it, you feel it, you taste it, and I knew right then and there I had two broken legs. "So I looked over my shoulder and yelled, 'Hey, I got two broken legs. How's everybody else?'" Each of his Soldiers answered they were okay. "So, now that I know the guys are okay, it's time to assess my own wounds," said Karcher. That's when he saw that his legs "were just gone." "That was the day that my life changed," he said. What followed was surgery, hospitalization, and lengthy, difficult rehabilitation where he learned to walk on artificial legs. He retired from the Army in 2015. At one point in his recovery things became especially dire, with a combination of problems involving his heart, lungs, kidneys and stomach, infections, high fever. Karcher, 6 feet 4 inches tall, saw his weight drop 120 pounds, from 225 pounds before his wounding to 105. But Karcher, who had been a believer in Christ since his early teens, believed God would enable him to work through his plight. At one point during his struggle to recover, a local pastor told him it was "okay to be angry with God." But, Karcher told the audience, he laughed at that suggestion. "'Padre,'" Karcher told the pastor, "I'm not pretentious enough to be angry with God. I mean he promised me eternal life, not eternal legs.'" "What got me through this was faith, family, friends and finances. I had faith that my God would make something good come of this. My family was there for me through the whole process. Friends came out of the woodwork and were supportive of us, and we had our finances straight." "You'll never have a mountain in front of you that you can't get over with God alongside of you." Karcher spoke for nearly 20 minutes and finished to a standing ovation. His talk was followed by a vocalist, Sonya Roberts, singing "Midnight Cry," which she delivered in classic, church gospel style, accompanied on the piano by her husband Joey Roberts. Throughout the song, the audience sat hushed and motionless, and at the final notes, again came to its feet in a standing ovation. The breakfast opened with welcoming remarks from Maj. Gen. Gary M. Brito, commanding general of Fort Benning's U.S. Army Maneuver Center of Excellence. Observance of the National Day of Prayer is "an extremely important event for the military," said Brito, in part because it affords "a great opportunity to count the very blessings that we have day in and day out." At the start and end of the breakfast, the MCOE Band's "Woodwind Quintet" performed traditional hymns, including, among others, "A Mighty Fortress is Our God," "Abide With Me," and "What A Friend We Have In Jesus." One of the musicians was Staff Sgt. Paige Canafax, a clarinetist, who listened closely during Karcher's talk. The main point she took away from Karcher was that "all things through Christ are possible." Karcher "overcame many great challenges and his faith is really what got him through that," she said. The National Day of Prayer is observed annually and was established in 1952 by a joint resolution of Congress and signed into law by President Harry S. Truman.